And then, after three days, they were tied with 76 pounds, 12 ounces. But they returned to Lake Conroe, with Iaconelli fishing along two stretches of the Conroe Dam riprap and Combs running to four different locations. Nothing. Iaconelli caught a 12-incher and tossed it back. Combs returned to the spot where he “left fish biting at the end of the day” and figured he’d get at least one, but they didn’t bite. Then, with 15 minutes left before the 6:45 p.m. deadline, Combs nailed a 15-inch largemouth. His TTBC judge made the call via cell phone to TTBC Judge Supervisor Tim Cook, who along with PAA Tournament Director Randy Knight listened as the fish was measured and verified. Combs capped a two-year flurry of outstanding fishing with the biggest win of his career. He won $100,000 and a new Legend Boat with Evinrude outboard. The TTBC field featured the top 15 points finishers from the Bass Pro Shops PAA Tournament Series, Bassmaster Elite Series and Walmart FLW Tour, along with defending champion Brian Snowden and four sponsor exemptions. Combs made his milk run Sunday of more than 50 spots on Lake Conroe, making 3-5 casts on each one with the crankbait before moving to the next one. He had blanked early in the morning while Iaconelli camped in his Caney Creek hot spot that yielded 75 pounds of his total on a Berkley Gripper jig and Rapala DT-10 crankbait in Helsinki shad color. Known among Texas anglers and, now, nationally, Combs has fished exceptionally well the last two years. 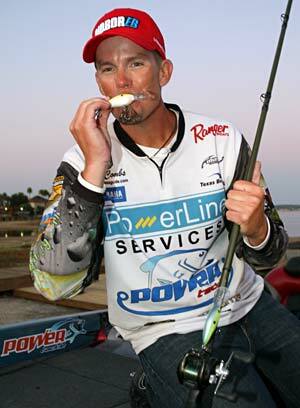 He competed on the Bassmaster Central Open circuit in 2010 and qualified for the Elite Series, and also in 2010 on the PAA Tournament Series. On that, he won the PAA’s event at Lake Tawakoni east of Dallas with a record-setting three-day performance and qualified for last year’s TTBC. This season, he stormed into the Elite Series as a rookie and had a fine showing, qualifying for the TTBC again. After moving from Del Rio, where he guided on Lake Amistad, east to Huntington so he could be more centrally-located, he said his fishing picked up as he grew more comfortable with the travel and level of competition.